When an emergency is unfolding at home, professional security monitoring makes all the difference. While you get your family to safety, a trained security professional responds to your home's alarm signal, assessing the situation, and alerting your local police or fire department. Now, professional monitoring is even more effective thanks to Smart Signal, exclusive to Alarm.com, a new, direct emergency connection to your home's monitoring station within your Alarm.com app. Smart Signal lets you use your app to trigger a panic alert, verify an alarm event, or quickly cancel a false alarm, using a new set of signaling buttons in your app. Each button triggers a specific Smart Signal from your security panel to the monitoring station, enabling the station's security professionals to act faster and relay more detailed information to your local police or fire department. In an alarm event at your home, you'll see these two buttons side by side at the top of your app's home screen. They'll stay "pinned" to the top of the screen even when you scroll down, allowing you to check your video feeds and image sensor pictures for activity, then respond quickly. 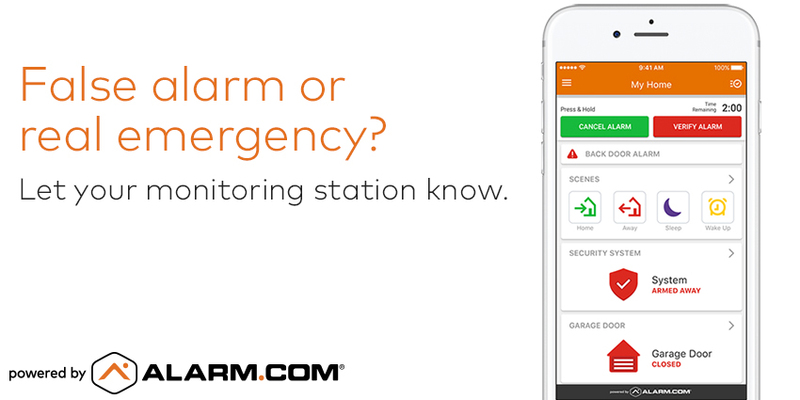 Hold the "Verify Alarm" button for three seconds to let your monitoring station know that the alarm event is real. Your confirmation gives them the information they need to call emergency help faster. If it's a false alarm, hold "Cancel Alarm" for three seconds to let your monitoring station know that no further action needs to be taken. 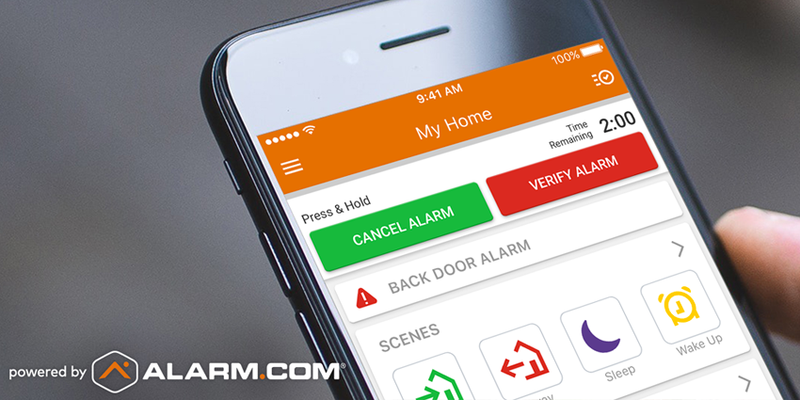 If there's an emergency at home that doesn't activate an alarm, and you can't make it to your security panel or call 911, Smart Signal lets you send a panic signal from your Alarm.com app. You'll find your Panic signaling options in the Security System area of your app. To activate a Panic, hold the button for three seconds. Some systems, depending on your security panel model, include options for a loud Audible Panic alert, as well as specific fire, medical and police panics. All panels, however, support the new Silent Panic signal, which lets your monitoring station know that help is needed without sounding an audible alarm at your panel. Unlike a security keyfob, which only works at home within range of the security panel, your new In-App Panic button can be activated from anywhere—so if you spot an emergency at home while you're out, you can activate a Smart Signal from your security panel for assistance at your property. To find out when Smart Signal will be available for your security system, contact your service provider. With proactive safeguards like Smart Signal, Crash and Smash protection and Unexpected Activity alerts, Alarm.com technology provides the ultimate protection for your family and home. To join the millions of homeowners protected by Alarm.com, enter your ZIP code below and connect with a service provider.